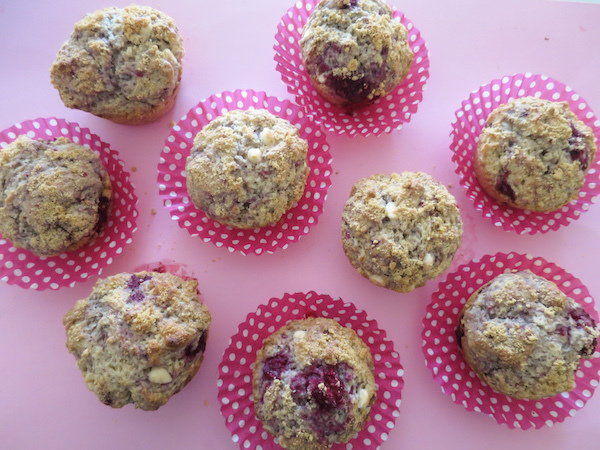 Sometimes you just need a good, wholesome and sweet MUFFIN! 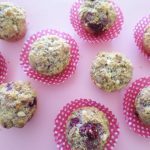 Wholesome enough make it to your breakfast and sweet enough for afternoon snack when you need a little extra kick and those juicy raspberries just do that! And the best, these are really simple and quick to make. 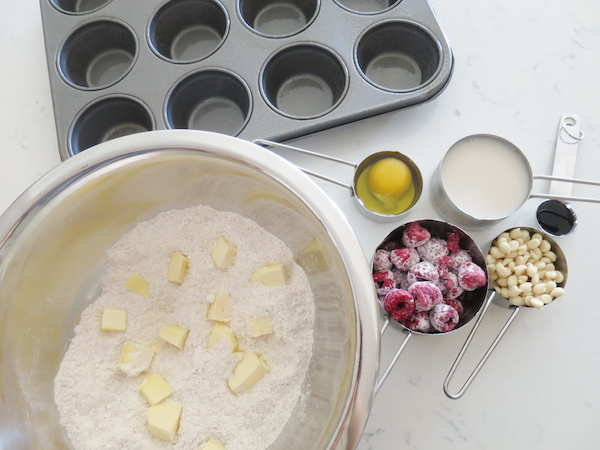 The recipe uses a mixer with flat beater attachment but a mixer isn’t mandatory, you can do the batter effortlessly mixing by hand and using a spatula to mix in the liquid and finally raspberries and white chocolate chips. I used a whole wheat Digestive biscuit for crumb on top, but really any biscuit crumbs are as fine. The recipe is easily adjustable for dairy free option, in fact I noticed my white chocolate chips were dairy free and the only dairy in these were butter that in this particular recipe can be substituted with margarine or coconut oil with very little effect on the flavour. Preheat oven to 225ºC (430ºF) and grease a muffin tin or line with muffin cases. 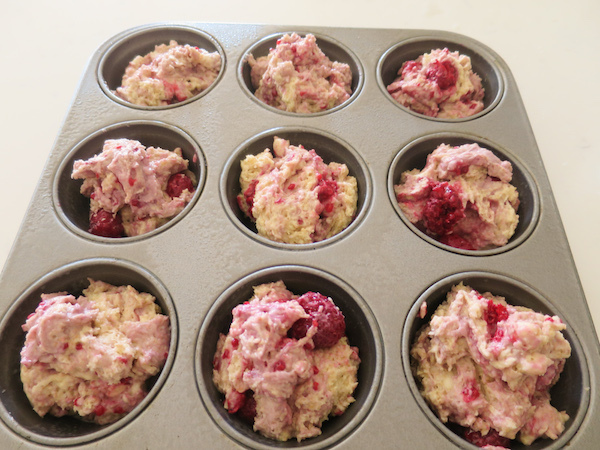 Coat frozen raspberries with potato flour and set aside. In a mixing bowl combine flours, sugar, baking powder and butter and beat with flat beater until resembles fine crumbs. Add egg, almond milk and vanilla paste and continue to beat on medium speed until incorporated. 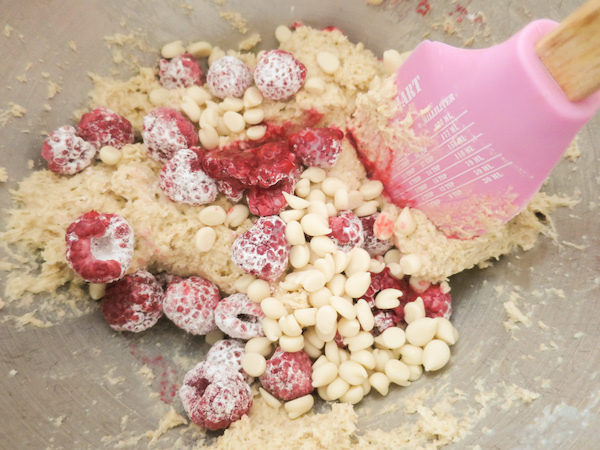 Remove from mixer and add raspberries and white chocolate chips gently folding with spatula. 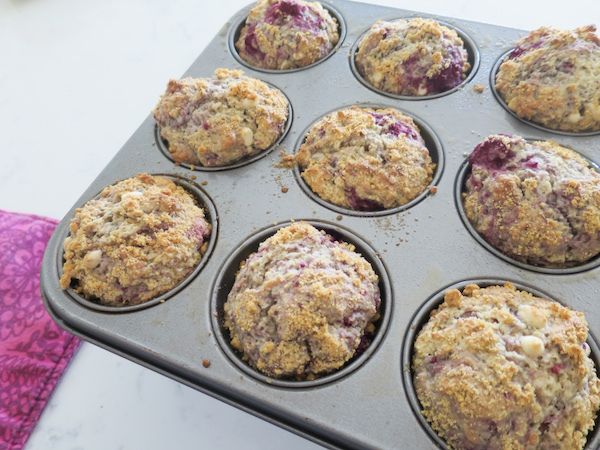 Spoon into muffin tins, sprinkle crushed digestive biscuit crumbs on top and bake in preheated oven for 10-12 minutes until a toothpick inserted in middle comes out clean. Lift onto a wire rack and serve warm.